Main photo: One of four secluded villas, each with its own plunge pool on the deck, an elevated sala on stilts among the trees, with suspended chairs to watch the activities at your private waterhole. 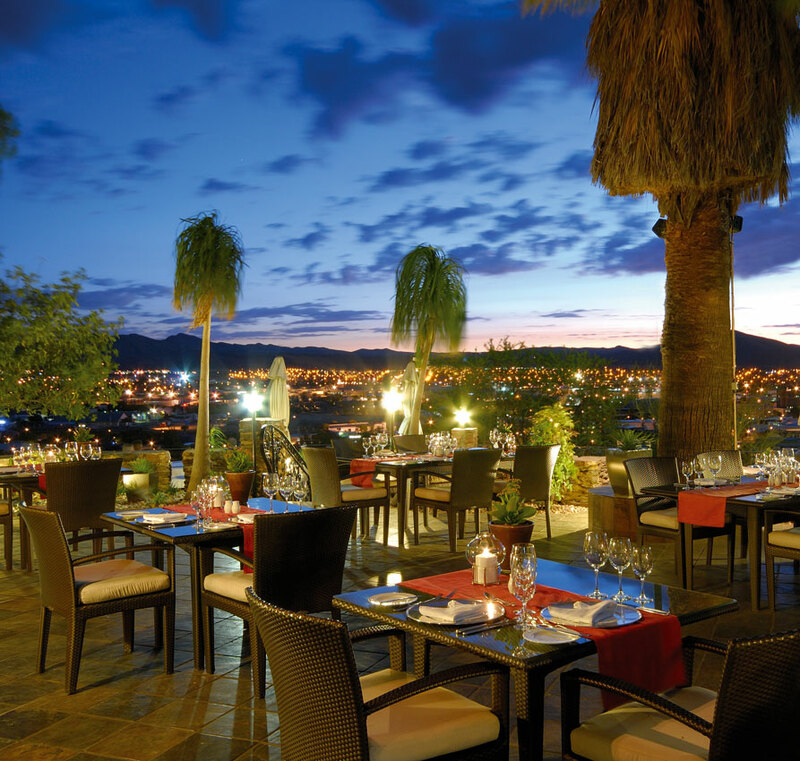 Enjoy a romantic dinner under the stars. As one turns off the tarred road just past Windhoek’s International Airport, the adventure starts. Namibian author Piet van Rooyen wrote recently that this region has always been an important haven for game. Even today the highest density of game per square kilometre in Namibia is found here. It is a natural reservoir of animals, a kind of paradise, he wrote. And so it is. Along the side of the white gravel road, and behind ordinary or high game fences, we spot gemsbok, kudu, duiker, hartebeest, impala, steenbok and warthog – even a giraffe. We marvel at the thick billowing clouds against the clear blue sky and the smell of the damp red earth. 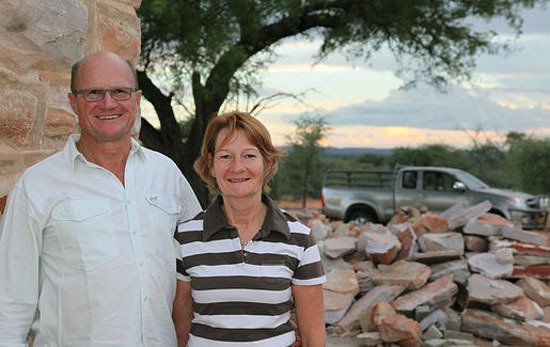 Wilfred and Anita Slaney’s history is rooted in the Namibian soil. To grow up on a farm in Africa creates a connection that stays part of you forever. So when they had the choice to further their engineering careers outside the country of their birth, they opted to bring up their children in Namibia. 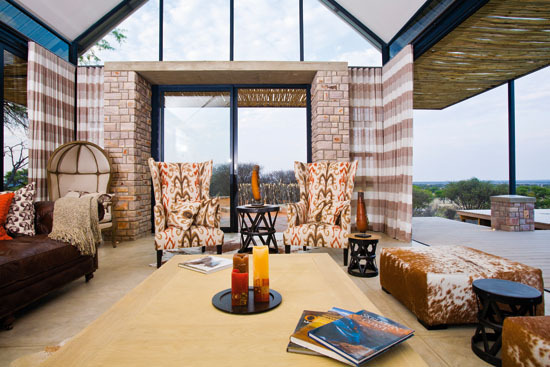 After more than 20 years in the tourism sector, they took the bold step to invest in an upmarket lodge with four exclusive villas on the farm where Wilfred’s grandparents had settled almost a hundred years ago. In the Herero language Otjimbondona means the place of the little camel thorns. But don’t be fooled. The camel thorn trees along the way to the farm east of the capital are all but small. The Herero people called it that, because from the place where Wilfred’s grandmother built her house on top of a hill, the trees do look small compared to the endless vista. 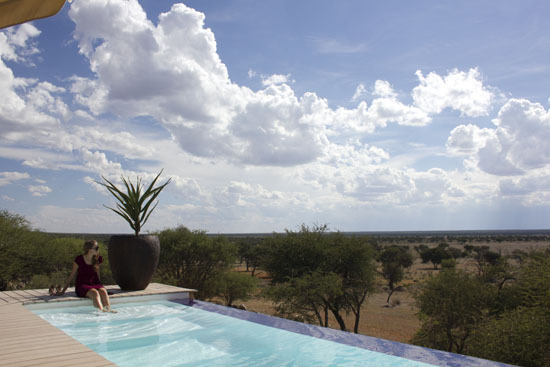 The Slaneys’ knowledge of what visitors want, their love of the land and their warm Namibian hospitality are evident when you step out of your car on top of the hill, in awe of the breathtaking, 360-degree view. Against this backdrop stands a most amazing modern architecturally designed structure with, at the heart of it, the original rooms of grandmother Slaney, built in the local stone by an Italian stonemason. The wooden deck with infinity pool facing the setting sun, a modern gym with a view, deep leather couches, breezy fabric and lovely artwork, Methode Cap Classique on ice, warm home-baked bread and secluded elegant villas, these tell only part of the story. The first part of the story started in the 1980s when Wilfred, who had obtained his pilot’s licence as a student, flew guests for the late Louw Schoeman’s Skeleton Coast Safaris. “For me, a pilot is not only a pilot, but also a host, a guide, an important leader of the group, who must ensure the best experience for the guests,” says Wilfred, who hosted fly-in adventures from Cape to Cairo, to Botswana and all across southern Africa. “My aircraft is parked on the landing strip down the hill, ready to take guests on scenic flights, day-trips and fly-in safaris to anywhere in the country. The villas are positioned to make you feel as if you are alone on the planet. From anywhere inside the villa you have a view – even from the shower. Each villa is decorated to reflect a different theme with stunning images and elegant design features. A ceramic fireplace, soft luxurious linen, quilts and throws, special details and personal touches, such as refreshingly quirky wildflower on the pillow and an espresso machine in the lounge, are carefully planned to make you feel like the special guest you are.